Troubleshoot what could be causing issues for your Tessitura Extraction imports. When Extractions are not showing up in WordFly or not importing into WordFly and your WordFly-Tessitura integration is passing all test results, there are a few things to check that might be causing the problem. Check these things if your Extraction is not showing up in WordFly. 1. Is the TMS box checked for the Extraction? Under Extraction Details, the TMS box must be checked for the Extraction to be available to WordFly. 2. Is there an Appeal selected for the Extraction? Under Extraction Details, make sure an Appeal is selected for the Extraction. The Appeal is required for promoting your Extraction in Tessitura. Only Extractions with Appeals selected will display in WordFly. Refer to screenshots in point 1 above for visual guidance regarding where the Appeal is on the Extraction Details step. Check these things if your Extraction is showing in WordFly but not importing. 1. Is the Extraction destination set to 'file'? In the Extract Constituents steps your Extraction destination must be set to 'file' (not 'list'). WordFly is importing a file from Tessitura so this is required. 2. Is the Extraction saving to the TMS output/pickup folder configured in T_Defaults? Ensure that your Extraction is saving in the TMS_Extraction_Pickup and TMS_Extraction_Output directories configured in T_Defaults. The Extraction saving process is initiated by Tessitura (not the WordFly services). This process is running on the database server under the SQL Server Agent proxy account. The WordFly identity account needs to have access to the extraction downloads folder. If extractions are saving with no error to the extractions folder, please check to see if they are saving to the "Transfer\Downloads\" folder on the live SQL server for WordFly. 3. Is the control group for the Extraction available to WordFly? The control group is assigned to the Extraction under the Extraction details view in Tessitura. Check that the correct control group has been selected. The control group must be available to WordFly. Additionally, any custom output set elements in the output set must have the correct control group selected. 4. Is the output set for the Extraction available to WordFly? The output set selected in the Extract Constituents step in Tessitura must be available to WordFly. Check that the selected output set has the TMS box checked and the correct control group available to WordFly. 5. Did your WordFly-Tessitura integration recently experience downtime? Extractions won't be saved properly to the TMS output/pickup folders when the WordFly-Tessitura integration is down. Re-running the Extractions in Tessitura should resolve this. 6. Are there any errors in the Extraction log? In Tessitura, highlight your Extraction and select Extraction Manager > View Log. The log will give you more details about this Extraction and will show if any errors occurred when saving it. Are there any failures listed in the log details? You may need to reach out to Tessitura support to resolve issues that appear here. Sometimes there's an issue with the WordFly-Tessitura integration where the Extraction folders (TMS_Extraction_Pickup and TMS_Extraction_Output) are no longer available to WordFly. WordFly support will be able to tell you if the Extraction folders cannot be found. Check these things if your Extraction folder is not accessible to WordFly. 1. Check the values set up in T_DEFAULTS for TMS_Extraction_Output and TMS_Extraction_Pickup. The TMS_Extraction_Pickup and TMS_Extraction_Output values in T_DEFAULTS should refer to the same location; with the former relative to the gateway server and the latter relative to the database server. Check that you have configured the correct permissions for the TMS_Extraction_Pickup directory by granting Everyone the Modify right. The SQL server agent account on the database server must have write access to this directory. 2. Are the database server and the gateway server in a common domain? 3. Are the database server and the gateway server not in a common domain? *For steps 2 & 3, if there are still issues you should also try creating a domain account or local accounts on both the gateway and database servers that have matching credentials. This might resolve the communication issue with finding the folder. 4. Try adding the computer name to Extraction folder. In rare cases, Extractions created by some users will not import while Extractions created by other users will. If all troubleshooting steps from the first section of this post have been ruled out there might be a issue with the user's Tessitura login. Check the permissions for the user's Tessitura login and ensure the user has all the same permissions as other users. If needed, deleting and recreating the login may be needed. WordFly has updated how imports are processed. Extractions now require UTF-8 encoding in the WordFly web.config to process addresses with + symbols, e.g., address+new@gmail.com. 1. Locate the WordFly web.config on the Tessitura IIS server. 2. Open the WordFly web.config. 3. In the web.config file, search for 'extractionEncoding='. 4. Update "utf-7" to "utf-8". Why did this issue start happening now? 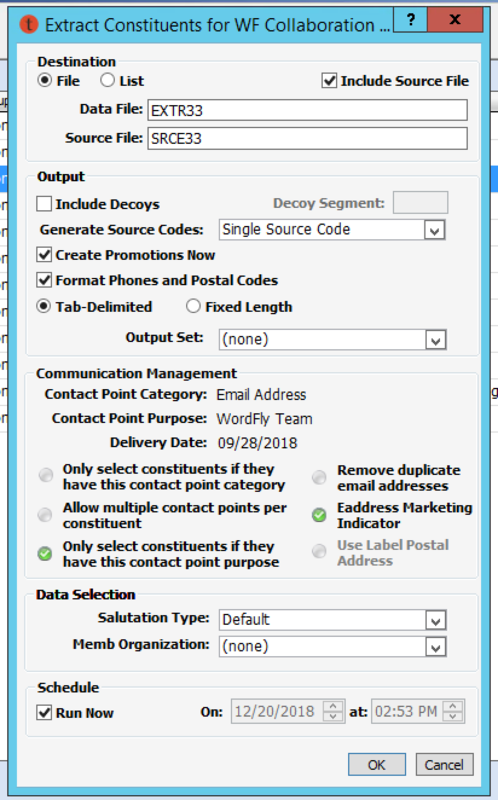 In August 2017 WordFly updated how lists are processed. If you use Extractions for list imports, the encoding setting needs to be updated in the WordFly web.config. Where will I see this error if the encoding is not updated? When an Extraction import completes, users will see invalid addresses under the import issues section for any addresses that contain a + symbol. As soon as the encoding setting is updated to UTF-8, these addresses will no longer be considered invalid. Who do I need to talk to make this update? Your IT team should be able to make this change easily. The WordFly web.config is located on the Tessitura IIS server. WordFly should have an application pool on this server. This is where the web.config will be located. The change is very simple: Open the WordFly web.config, update "utf-7" to "utf-8" and then save/close the web.config. Can the WordFly Support Team help if needed? Please email us if you need any assistance. We can answer questions or schedule a remote session with your IT team to walk through the update.